One morning I went out to, and upon my return three hours later, surprise, the park next to my home was invaded by a rhythmic succession of building modules. The modules developed in the blink of an eye and without warning. It’s like a bad dream, but unfortunately it’s harsh reality. 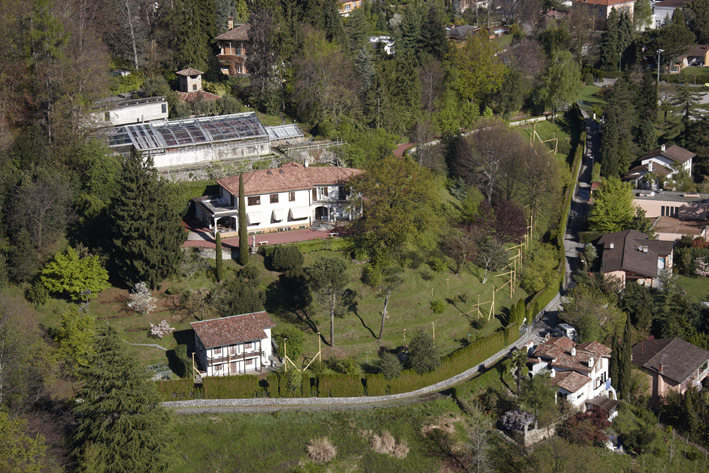 Not that the apparition of modules in the least expected places is rare, but in this case it happens that the modules are erected on the grounds where Hermann Hesse lived, the “Casa Rossa” in Montagnola, Switzerland. A location with an extraordinary cultural history, a precious gift for the community and, I would dare suggest, for humanity. Not that I am nostalgic, for surely the world changes. The speculative building project which is planned on this site represents the opposite of everything Hermann Hesse wrote. The world truly has need of his values. It is no wonder that Hesse’s works are still read and translated throughout the world. Tourists arrive in Montagnola from everywhere, in mystic pilgrimage. The growing popularity of the Hermann Hesse Museum testifies this. Hesse emphasized the individual, in his fragility, in search of an identity and guidance in the great sea of life. In contrast to the illusory certainty of appearances and of the power of money. Every place has its importance as it is keeper of written and unwritten stories. Through the strength of his philosophy, Hesse made this small corner of the earth a place of universal inspiration for anyone who seeks to follow an individual path. This place deserves a more dignified future than that which awaits it. Being the heirs to such a wealth is a fortune and a privilege, but this does not come without responsibility, ethics and aesthetics . The right to property is sacred, of course, but there might be other less invasive solutions. Not a banal Legoland. Das spekulative Bauprojekt, das man in diesem Park hochziehen will, stellt das Gegenteil von allem dar, was Hermann Hesse geschrieben hat. Wir brauchen wirklich andere Werte! Nicht von ungefähr werden seine Bücher nach wie vor in viele Sprachen übersetzt und in der ganzen Welt gelesen. Und die Besucher kommen von überall her zu diesem Hügel, zu seinem Park, auf ihrer mystischen Pilgerreise. Zeuge dafür ist der wachsende Erfolg des „Museums Hermann Hesse“. Hermann Hesse unterstrich die Bedeutung des zerbrechlichen Individuums auf der Suche nach einer eigenen Ausrichtung und einer eigenen Identität im Meer der Unsicherheiten, das das Leben ist. Im Kontrast zur trügerischen Sicherheit des äusseren Anscheins, der Macht und des Geldes. Jeder Ort hat seine Bedeutung und ist Wächter über Geschichten, geschriebene und nicht geschriebene. Hesse wusste diese Ecke Erde durch die Kraft seiner Gedanken universal zu machen, ein Ort, der jetzt im Unbewussten der Allgemeinheit existiert und jene inspiriert, die daraus Anregung für ihren Weg ziehen. Ein Ort, der ein anderes Schicksal verdient als jenes, das auf ihn zu warten scheint. Das Glück zu haben, Erben eines Kulturgutes wie dieses zu sein, bringt Verantwortung mit sich – sowohl ethische als ästhetische. Das Eigentumsrecht ist heilig, gewiss, aber es gäbe auch andere, weniger invasive Lösungen als ein banales Legoland. Il progetto in questione, oltre all’impatto paesaggistico avrebbe una ricaduta sul turismo del luganese, in particolare mostrerebbe un’attitudine da parte delle autorità non attenta al turismo culturale e alla salvaguardia di una memoria storica che non tutti i luoghi hanno la fortuna di avere. Non dimentichiamo che molti turisti arrivano a Montagnola da tutto il mondo proprio per visitare i luoghi dove aveva vissuto Hermann Hesse. Esattamente. Basti pensare a quanti turisti, passeggiando per la Via, chiedono ai residenti quale sia la Casa Rossa di Hermann Hesse. Oggi ci limitiamo a spiegare che la casa è bianca! Domani cosa faremo? Potremo sempre utilizzare le fotografie storiche! Giusto! I cittadini ovunque devono prendere posizione contro la negligenza e l’arroganza delle amministrazioni comunali quali a causa della loro cattiva pianificazione di piani regolatori provocano la cancellazione di luoghi storici e culturali. E Montagnola e’ un esempio lampante del fatto che la mancanza di apprezzamento culturale delle autorità’ comunali ha portato a trattare il parco della Casa Rossa dove abito’ per più di 30 anni il Premio Nobel Hermann Hesse, come qualsiasi altra proprietà’ e quindi a non provvedere alla sua tutela dallo scempio edilizio. Adesso la scelleratezza di chi cerca di speculare vuole convertire un paradiso culturale dell’umanità in una vergognosa “Legoland”. Questo progetto rovinerà’ il prestigio di cui Montagnola e la Collina d’Oro gode da quando Hermann Hesse mise piede qui. Siamo disgustati! Amazing .. I’ll bookmark your blog and take the feeds additionally?